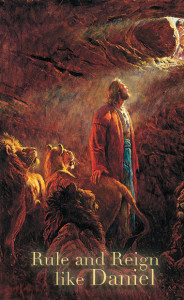 Daniel was divinely gifted in understanding visions and dreams (Dan. 1:17). He was prepared beforehand for his life crisis. Life is step by step, this one day by one day. It is essential to live in the little places, to be faithful in small things. Otherwise we perish in the big test, not having passed the small test. Surrender today prepares for a tomorrow that can’t be imagined. Our preparation by the Most High is perfect if we fit into its order.